The mining industry faces many challenges, most notably lower quality reserves. With the decreasing quality of mined feed, more sophisticated techniques are needed to achieve industry required specifications. 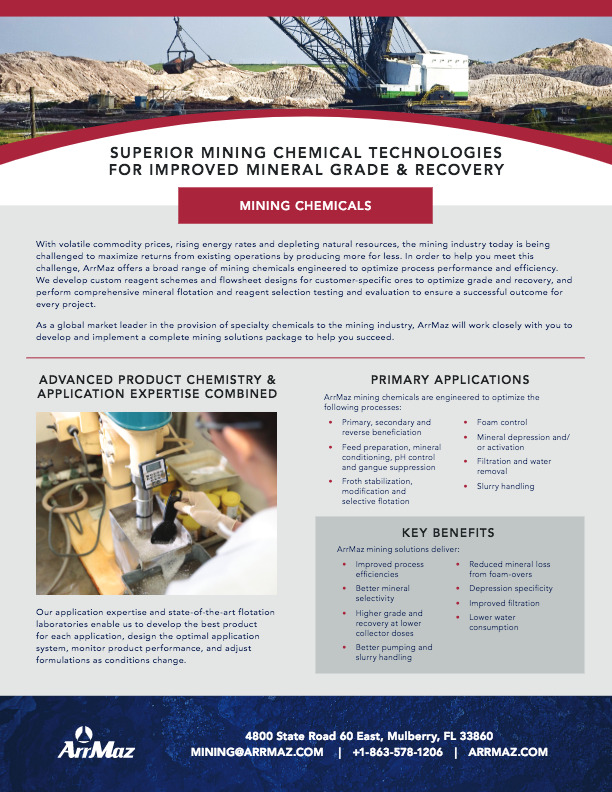 In many cases, the typical means of altering pH or applying different chemistries is not enough to offer the mineral selectivity needed to achieve required recovery and grade goals in flotation. Depressants are often used to increase the efficiency of the flotation process by selectively inhibiting the interaction of one mineral with the collector, for example, the depression of quartzite to allow for more optimal apatite/collector interaction, thus improving final recovery and grade. ArrMaz’s flotation depressants have been custom developed for a variety of applications. They help depress gangue minerals while increasing recovery and selectivity without sacrificing grade. Our depressants have been especially effective in phosphate, silica / glass sand and iron beneficiation.